Reds’ captain Jamie March received the West Lothian Cup from Livingston President Lee Anne Steel, following the Reds’ 49-39 victory in the cup and league double-header at Livingston on Saturday. It was a cracking day of rugby for the Reds, as the senior team retained the West Lothian Cup, in addition to claiming a bonus point league win, with a fine 49-39 victory over local rivals Livingston, whilst the u15s and u16s both won big, racking up 140 pointsbetween them. 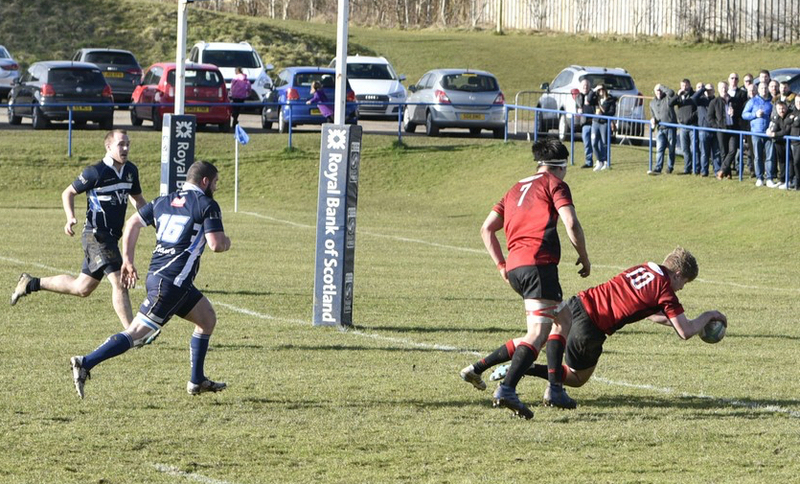 The sun shone in Livingston on Saturday and we had some sunshine rugby to match as the Reds went toe to toe with Livingston and emerged with a massive 49-39 victory in this league and cup double-header. 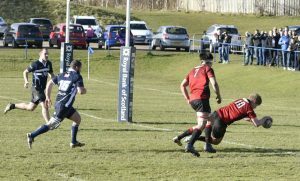 The Reds scored six tries, with a brace from Andrew Whitelaw and other tries from Rab Cairns, John Strachan, John Chapman and Lewis Herdman. John Strachan took his personal tally to 24 points adding 5 conversions and 3 penalties. On Saturday morning, the u16s ran in 12 tries in their fine home win over their Portobello counterparts, whilst the u15sclaimed a great away win at Stirling County, running in 11 tries in total.